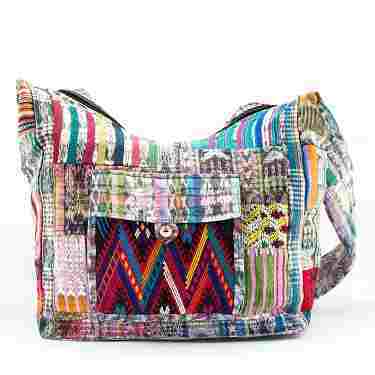 Eco- Chic and environmental friendly recycled patch purse from vintage hand embroidered and handwoven fabrics from the Mayan huipiles (women's traditional dress still worn today in different regions of Guatemala). 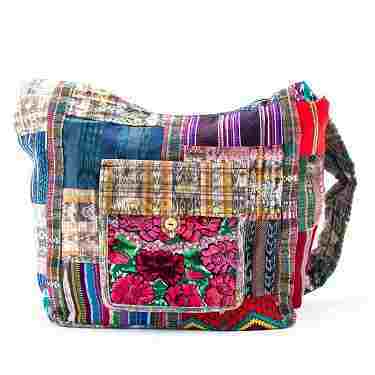 Made according to Fair Trade principles by Guatemalan artisans. Great book bag or diaper bag. No two are alike. Hangs hip length, strap is 39.5", bag is 15.5"x 15.5". Fully lined. Zipper closure. We stress again that NO TWO ARE ALIKE!!!! While all the bags look similar, the huipile patch on the front will not be identical to the one in the picture. The patches are geometric or floral patterns but all are equally beautiful. I tend to carry alot of stuff with me, this bag is the perfect size and very durable..not too mention adorable! I get compliments on it all the time!